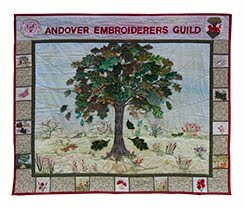 Andover Branch Embroiderers' Guild: JUST A REMINDER! Monday 19 November 2012 - Riding a Wave, a talk by Carolyn Sinclair. Click here for more details about Carolyn's work. The meeting starts at 7.30 pm in Priory Hall, see JOIN US for full details. Saturday 24 November 2012 - Our last workshop of 2012, making Christmas Baubles with Jan Tregigdo. Click here to find out more about Jan's work. Call 01264 364688 if you want to attend. The workshop takes place in Goodworth Clatford Village Club, see JOIN US for full details. Monday 10 December 2012 - Our Christmas Social. The meeting starts at 7.30 pm in Priory Hall, see JOIN US for full details.